Who doesn't love the sight of green grass growing after a long winter?! Why not bring some of that springtime cheer indoors by growing your own wheatgrass? Now that Easter is about 3 1/2 weeks away, this is the perfect time to start sprouting wheatgrass in your own home. Want to grow along? Here's what you need to do. -a container to grow it in. You can use just about anything: a bowl, a pretty pot or tray, a seed starter flat, the bottom of a milk carton--anything. I actually used plastic catch basins that are typically put under houseplant pots. First, rinse the seeds using cold water. Then soak them in water for about 6 hours or until they are sprouted. This may take up to 12 hours. After the wheatgrass seeds have sprouted, line the bottom of your growing container with 2 inches of soil. Drain the seeds in a colander and spread a single layer of them onto the soil, trying to cover all the soil without too much overlap in the seeds. Then, sprinkle the seeds with a light layer of soil, and use a spray bottle filled with water to lightly water the seeds. Put the basket or container in a warm area of the house that isn’t in direct sunlight. The area should have a temperature of 65 to 75 degrees. Cover it with newspaper and leave it alone for now. Every morning, spray the seeds with water then recover with the newspaper. Too much water can result in moldy seeds, so go easy. The newspaper can be removed once the leaves start to sprout. 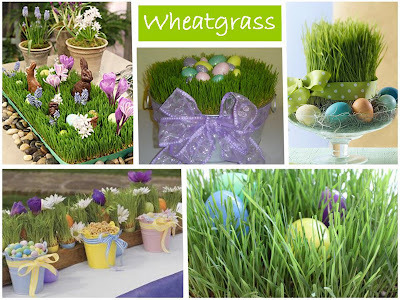 In about a week and a half, you should have about 8 inches of wheat grass to use in your Easter decorations. YAY!! Then when Easter is over, cut some and blend it up with some fruit and juice for a smoothie – healthy bonus! Let us know how your wheatgrass grows! I'd love it if you joined the Glitter Link Party! Let the Easter Knitting Begin!